Interesting how He used to be such a micromanager, back then. You’d think an immortal omniscient being wouldn’t change His management style so much. Yes, I had to look it up. My first guess was servants or slaves. Somehow this never came up in any of the sermons I heard. I liked the concept that a piece of land was valued in proportion to the amount of seed required to plant it, as well as prorated to the time remaining to the next Jubilee year. So was the expression actually “A vas, me hearties!”? Sailors are pretty much focussed on one thing when they arrive in port. Around here bad puns are known as Dad jokes, for some reason. Koran tops that for mysogeny. 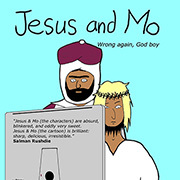 Why is Jesus sharing an apartment with Mohammed Ali? ummm.. but that’s not… oh nevermind. It’s because they’re friends. one floats like a butterfly and the other walks on water. Some of the Dawkinsite points made by the Barmaid are rather unfair. 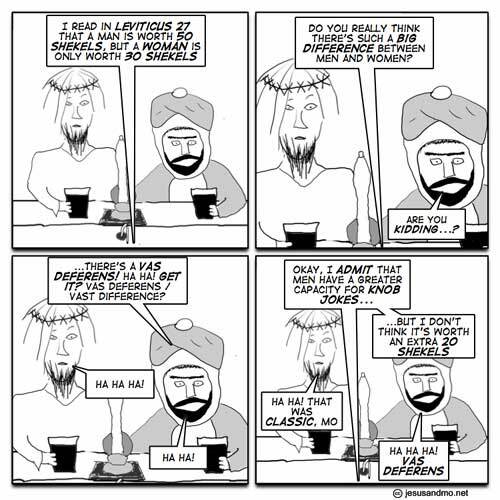 Christians and Muslims aren’t answerable for Leviticus. She should’ve directed that one at Moses. In fairness they should really answer to both, God is all knowing so why would he chang his mind between volumes? The Koran and the New Testiment are just in essence the latest additions supposedly written by the same (suppoesedly) omnipotent, omnicient God, so there shouldn’t really be much difference between them. Quantum Pancake, Jones! You two made me spit coffe all over the keyboard. And people wonder why I love the comments as much as the strip. Still RgOTFLMFAO!!! It’s because, like the strip, the comments are sometimes funny, sometimes deep, and sometimes both.